This year, Chapin’s Middle School robotics team launched a new program to help students become more comfortable with invention. Inspired by the theme of this year’s robotics team, which is education, the girls decided to create the first-ever Middle School Design Competition. Once the competition was announced, robotics coach Trude Goodman said, almost a quarter of the Middle School students signed up to test out their creations. Tasked with creating inventions meant to improve the lives of the Chapin community and beyond, over 50 students teamed up in groups of two or three to brainstorm, research, build and present their creations. The students were evaluated by Chapin faculty on the basis of how innovative their ideas were, how aware the students were of the real world applications, the quality of their prototypes, and on the students’ overall preparation and presentation. After initial rounds of the competition, which featured an intriguing device intended to save water and a robot that would help a teacher to get the class’s attention, the judges whittled down the competitors to five groups who then presented to three guest judges in early January. Finalists Erin Aftanas and Maddy Creed from Class 7 presented their “Bat Vision Glasses,” which use echolocation to help visually impaired people find their way. 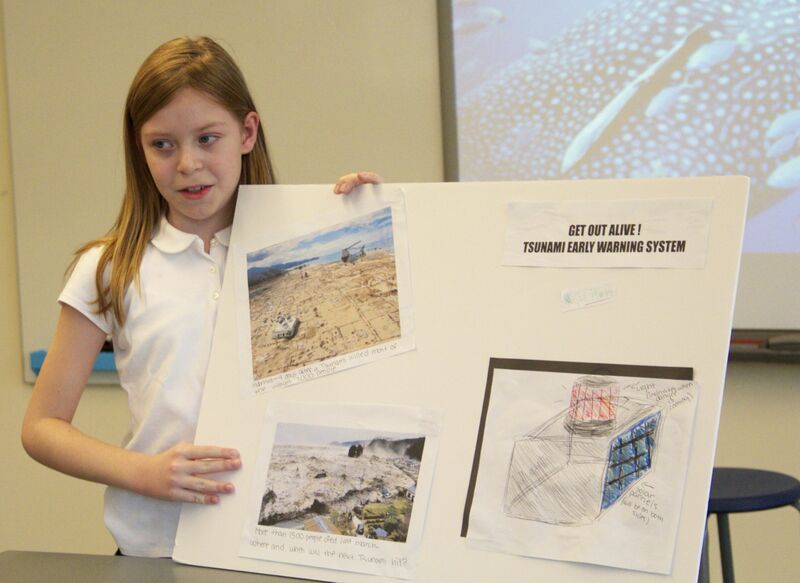 Abby Abramson, Hana Dolan and Campbell Conard from Class 6 used their observation of a common classroom problem—papers being turned in without a name at the top—to design a device that would scan the handwriting on a paper to identify the paper’s owner. Class 6 students Allison Moon, Sarah Stephenson and Emily Fisher created a “Homework Tracker” device, which enabled students to remind themselves to bring certain books to class and to do their homework. The “Blind-No-More Traffic App,” designed by Class 5 students Abigail Solomon and Nicole Berger, looked outside of the School to address how to make it safer for those who are visually impaired to cross the street. Lastly, Sophia Aalami, Reese Gaon and Amelia Lehv of Class 4 brought the house down with their design, “The E-Check In.” With this device, they hoped to employ an electronic check-in and check-out system to make a Chapin students’ arrival and departure more seamless. The day after the design competition, the results were announced: The E-Check In was the winner! The next step, as it would be for any inventor, is to find ways to develop the product. Participating students were given a survey before and after their presentations. Ms. Goodman said that the data showed that the students felt a higher level of comfort with inventing after participating in contest. After the success of this first Middle School design competition, Ms. Goodman says that the robotics team is delighted to have energized a new group of inventors.